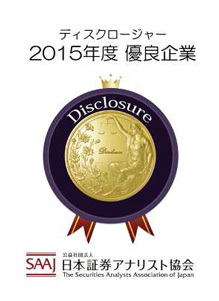 Tokyo, October 7, 2015 – Fuji Heavy Industries Ltd. (FHI), the manufacturer of Subaru automobiles, has been selected as the top company in the “automobile, auto parts and tires” category of the 2015 Awards for Excellence in Corporate Disclosure presented by the Securities Analysts Association of Japan (SAAJ). This is the second consecutive year that FHI has received this award. FHI received high marks topping in four of the five criteria among the 20 companies in the “automobile, auto parts and tires” category that were evaluated.